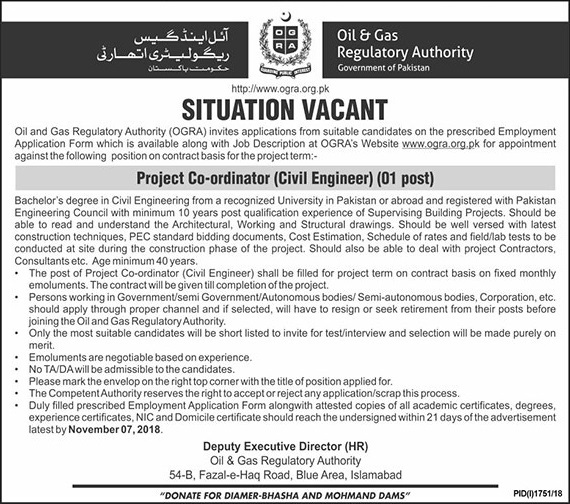 Oil & Gas Regulatory Authority (OGRA) Islamabad. Qualification & Experience: Bachelor Degree in Civil Engineering from recognized University in Pakistan or abroad and registered with Pakistan Engineering Council, with a minimum of 10 years post qualification experience of Supervising Building Projects. Duly filled prescribed Employment Application Form along with attested copies of all academic certificates, degrees, experience certificates, NIC and Domicile certificate should reach the undersigned within 21 days of the advertisement latest by November 07, 2018. 54-B, Fazal-e-Haq Road, Blue Area, Islamabad.